Use this wonderful pot to make your favorite soup, seafood boils, or virtually any other item. Stockpot lid fits either Medium or Heavy weight pot. Lid will fit in 9.8" opening. Stockpot lid fits either medium or heavy weight pot. Lid will fit in 11" opening. Lid will fit in 11.8" opening. 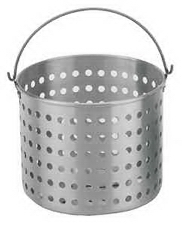 20-qt size lid. Stockpot lid fits either Medium or Heavy weight pot. Lid will fit in 12.6" opening. Lid will fit in 13.8" opening. Stockpot lid fits either Medium or Heavy weight pot. Lid will fit in 14.6" opening. 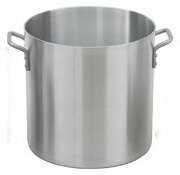 Mirror polished stock pot with commercial thickness for efficient heating. Dent resistant surface to endure duty in a professional kitchen. Easy to clean. Riveted side handles. Stockpot lid fits either Medium or Heavy weight pot. Lid will fit in 17.3" opening. From steaming seafood or vegetables to making chicken stock a stock pot is about as versatile an instrument as you will find in a commercial kitchen. Stockpot lid fits either Medium or Heavy weight pot. Lid measures a total of 20". Lid will fit in 18.9" opening. and boiler.Perfect for tamales and other uses. 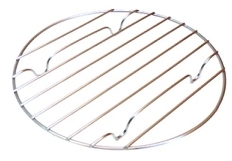 This round stainless steel steam rack makes steaming dishes much more convenient, allowing air to circulate better in the steamer. The rack is multi-functional for steamer and boiler.Perfect for tamales and other uses. It is easy to clean and store.